When our family started making mattresses in 1929, we had one goal in mind: To put customers first. Nearly nine decades later, we believe that strategy is what has kept our factory-direct mattress store going strong year after year, but we also know that we couldn’t have done it without some of the best customers around. Today, we want to give thanks to all those who have trusted us with their sleep. We owe our success to you! 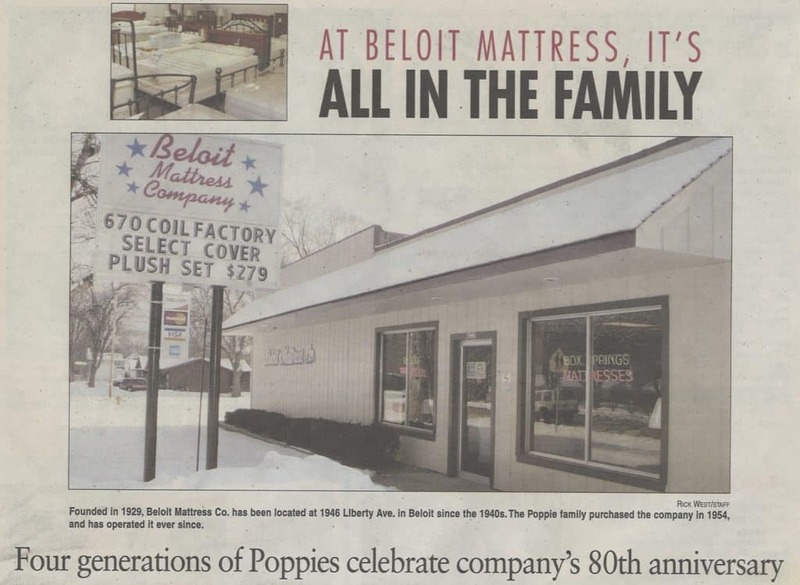 Beloit Mattress Company first opened as a tiny mattress factory in Beloit, Wisconsin during the Great Depression, producing some of the first innerspring mattresses to be made in the USA – each one by hand. From the beginning, our goal was not to sell as many beds as possible or to make a fortune for ourselves; it was to offer mattresses that would improve the overall health of our customers. We’ve always used the highest-quality materials and made every mattress by hand – no assembly line required, and even after all these years and with all the new technology, we still hand-make each mattress one by one. Because our customers’ sleep has always been our first priority, we’ve always offered products that are affordable to the average American. That’s why our founders decided to cut out retail salespeople – the middleman – and instead chose to become a factory-direct mattress store. To this day we still design, manufacture, and sell our products, allowing us to offer them at incredible prices. And because our company is family owned and operated, you can be sure that every person who is involved in making your mattress has extensive knowledge of what it takes to give you a great night’s sleep. Being a small, family-owned company allows us to not only make each mattress separately but to customize them to whatever size our customers need. We’ve always made standard size mattresses including twin, full, queen and king, but in keeping up with changing lifestyles, we also design and manufacture custom sizes. From narrow mattresses that fit RVs to twin XL mattresses for taller teens, we ensure that each customer gets what he or she needs in order to get great sleep in every unique situation. 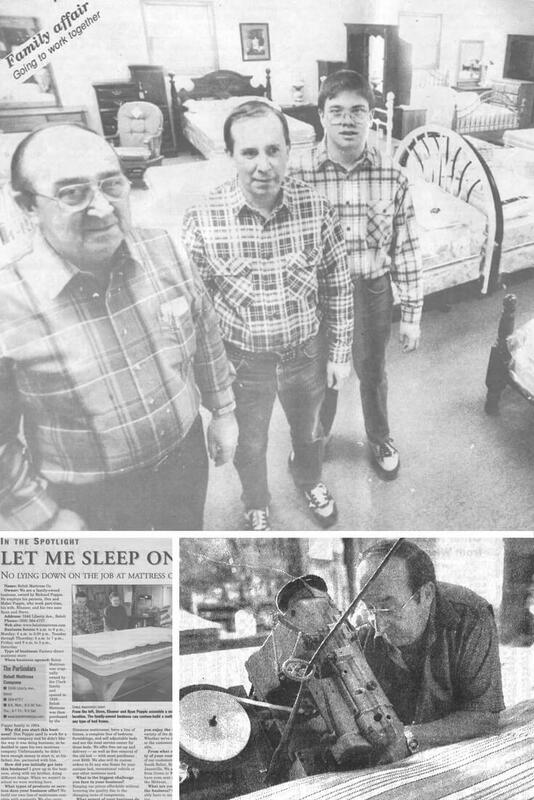 Our family originally aimed to provide mattresses for residents all around Beloit. But as the hospitality industry evolved and educational institutions grew, word spread quickly that our mattress company direct could manufacture and deliver large volume orders of high-quality beds. When it comes to quality, value, and service, Beloit Mattress Company is the best wholesale mattress company in the Midwest. From the moment our doors opened in 1929, we did what we believed would instill trust in our customers: We made high-quality mattresses and priced them as fairly as possible. But it was up to you to call and place an order, come into our store or visit our website and purchase our products. By trusting us with your family’s sleep, you’ve kept this family business alive, and for that we are truly thankful.